Most sequels are time warps: It’s the audience that gets stuck in a loop, experiencing the same premise all over again. So it should come as no shock that Happy Death Day 2U finds a way to zap sorority girl Tree (Jessica Rothe) right back into the live-die-repeat cycle she escaped at the end of 2017’s horror-comedy sleeper Happy Death Day. Tree, naturally, is livid, and as she storms into the same morning campus routine she suffered through ad nauseam the last time around, her volcanic exasperation is funny, sure, but it also threatens to mirror our own. After all, didn’t the first film already push the déjà vu factor to its limit? We weren’t just constantly reliving the same plot points as its frozen-in-time main character. We were also stumbling once more through the Phil Connors redemption plan, watching a selfish person Groundhog Day herself into basic human decency. Maybe Tree’s screamed-to-the-heavens “Not again!” is the proper response to a sequel that’s pushing its luck by pushing the reset button on what was already sort of a rerun. At first, it looks as though the movie might simply borrow a page from the slasher bible and pass the baton to a different protagonist. The film’s opening stretch is essentially a speed run of the original’s, except this time it’s comic-relief sidekick Ryan (Phi Vu) who finds himself stuck in time’s amber, being killed and instantly reborn just one day after his college roommate, Carter (Israel Broussard), helped Tree escape her own respawn purgatory. It’s not the most promising game plan, given how much of the first film’s marginal fun rested on Tree herself—and how much of a poor substitute Vu’s stoner-doofus routine makes for Rothe’s comic agony. It seems to promise more of the same, minus the charm. Thing is, more of the same isn’t entirely what this new film offers. The happy surprise of Happy Death Day 2U is that it does find ways to tweak the formula of its predecessor, to break the cycle of franchise redundancy. As it turns out, Ryan’s the one responsible for these chronological record skips, for his own predicament and Tree’s. The culprit: a very 1980s weird science project, a machine called the Quantum Cooling Reactor. It seems safe to say that no one was asking this series to explain the mechanics of its magical gimmick. 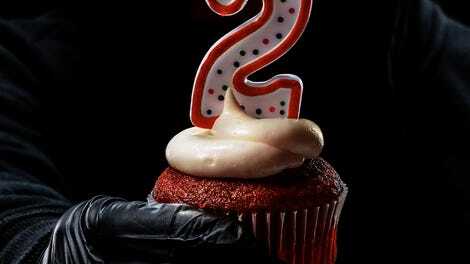 But in Happy Death Day 2U, returning writer-director Christopher Landon uses goofy time-travel mumbo jumbo not just to get his heroine back into cosmic limbo, but to alter the rules of her ordeal: The film’s twist is that while the day is the same, the world itself is…different. Her relationships have changed. So, too, has the identity of the baby-masked killer stalking her and her friends. Last time around, it was Groundhog Day, naturally, that got self-consciously name-checked. Here, someone lampshades the convoluted fun with an apropos Back To The Future 2 reference. Fans of the first Happy Death Day might complain that the sequel loses some of the simple pleasure of the original, cluttering up its borrowed, enduring premise with too many literally loopy complications, the way Robert Zemeckis once chased a resonant sci-fi comedy with a less soulful, more complicated rollercoaster ride through multiple timelines. But Landon’s first film honestly could have used some complicating; it didn’t do nearly enough with its Scream-on-repeat conceit. The best thing about it, by leaps and bounds, was Rothe’s inspired comic performance—the multiple shades of frustration she brought to Tree’s existential crisis. Happy Death Day 2U smartly keeps the focus on its lead’s manic-neurotic energy: bellowing a gloating “Ha!” as the killer tumbles down a flight of stairs, or grinning like a lunatic during a slapstick variation on the Phil Connors suicide montage. In many ways, this not-bad sequel feels more keyed to Rothe’s expressive shtick. Landon barely seems to be trying for horror anymore—probably the right move, given how little suspense he seems capable of wringing from the hide-and-seek murder scenes, most of which take place in the same few hallways of a curiously empty and boringly nondescript hospital. (For all this series borrows from Wes Craven, it could stand to take better notes on his mastery of tension and release.) Not that the comedy is more sophisticated: The addition of a disapproving dean (Steve Zissis) and a supporting posse of lab geeks spikes the genre blend with a new dose of broad Revenge Of The Nerds tomfoolery, which is basically subtraction by addition. Nonetheless, Happy Death Day 2U at least knows what it has in Rothe, the scream queen as delightful screwball star. And if a baldly sentimental tearjerker subplot actually lands, it’s because of the honest feeling the actor invests into Tree’s new moral dilemma. Putting this premise through another iteration would almost certainly be overkill, but when did a slasher franchise quit while it was ahead? With Rothe on board, it wouldn’t be so bad, doing the time warp yet again.